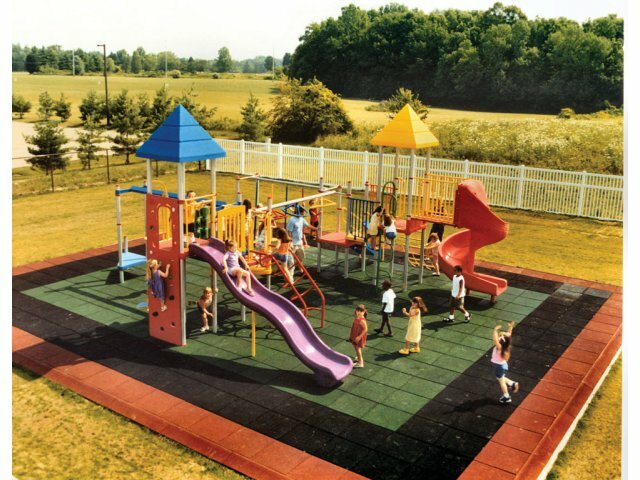 This classic playground set includes tons of fun events and educational opportunities. With so many activities to choose from, your students can find new ways to explore their abilities and challenge themselves every day. A large playground that accommodates up to 45 children at the same time ensures that you can truly find something for everyone. A track ride, turning wheels, Rock Wall, Chain Net Climber, Coil Climber and the two most popular slides will encourage your students to get active and really enjoy recess. 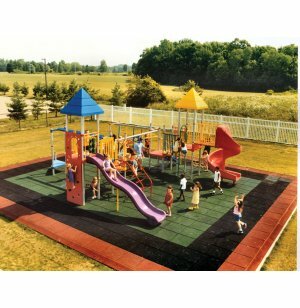 Playground sets promote important life skills such as problem solving, teamwork, gross motor development and much more. This sturdy rust-proof structure is built for long-term enjoyment and growth so your students can benefit from the best in outdoor educational fun for many years to come. Fun Fitness: Includes the Rock Wall, Chain Net Climber, Coil Climber, Wave Slide, Spiral Slide, a track ride, turning wheels and more. Shady Play: Roofs over two of the platforms keep kids cool, even when it’s sunny out.